Senator Iyiola Omisore Governor Rauf Aregbesola of Osun State. The Social Democratic Party (SDP) governorship candidate in Osun State, Senator Iyiola Omisore, has alleged that Governor Rauf Aregbesola’s administration plans to plunge the state into debt by awarding a fake contract worth billions of naira. 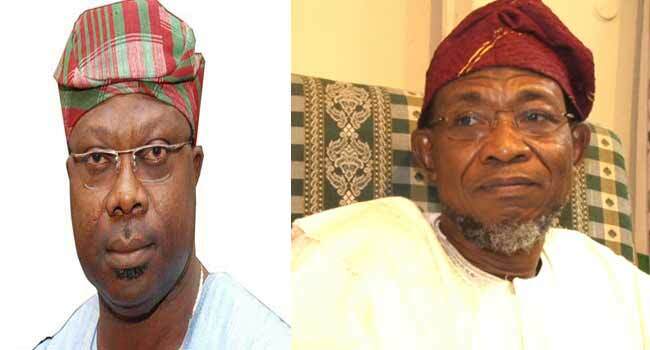 Omisore made the claims after meeting with the Traditional Ruler of Ilesha, Adekunle Aromolaran, at his palace in the state. Omisore further alleged that the state government plans to issue an Irrevocable Standing Payment to a company in charge of construction work for the next 15 years. He accused the government of embedding the “disingenuous scheme” in “a fake contract document”. But the state government rejected the allegations. The Commissioner for Information and Strategy in the state, Mr Adelani Baderinwa, branded the claims as “spurious allegations” and called on people in the state to ignore them. Boderinwa said the claims amounted to “gross irresponsibility” by SDP and Omisore. He accused the SDP candidate and the party of feeding the people “half-truths, outright lies and insinuations in a desperate move to seek attention”. The commissioner also rejected claims that N7.22 billion is deducted monthly from Osun State’s allocation. He said, “Governor Aregbesola had stated that the conventional loan obtained by the government would be settled in 2019 while the N11.4bn Sukuk would be fully paid back in 2020.